ScoutDocs offers an email notification service. 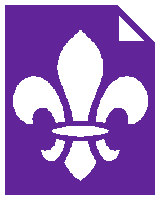 Once you sign up, we will send you an occasional email containing a summary of new content as it appears on ScoutDocs. Your email address will be held in the strictest confidence and will not be disclosed to anyone under any circumstances unless required by law. Your email address will be used only to send you the above-described emails. At any time, you can request that your email address be removed from our list. Once we receive your request, we will delete your address from our list.